Energy harvesting from environmental vibrations has seen an increase in interest during the past years as part of the generally growing awareness for alternative energy sources. Next to the typical electro mechanical methods, ferro electric devices have proven to be very effective in harvesting energy for low power devices as often found in portable electronics, sensor-controlled and condition monitoring systems due to the wide usable frequency range, and adaptability. Unused power exists in various forms, such as machine vibration, flowing water, wind, human motion, and shock waves. In recent years, industrial and academic research units have focused their attention on harvesting energy from vibrations using piezoelectric transducers. reduction in efficiency due to dielectric losses and depolarization. The development of piezoelectric composite material, like the MFC, helped overcome some of the limitations of the monolithic piezo ceramic components, especially brittleness, lack of reliability, and conformability. 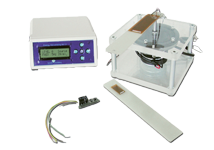 Battery free, autonomous devices functioning solely on harvesting mechanical vibrations with piezoelectric components. 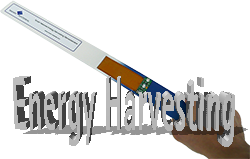 Complete battery free devices based on piezo electric harvesters are a reality today. Complete electronic devices with a power consumption of < 10mWs can be manufactured cost-effectively. With a connected storage for excess energy like a super cap or thin film battery, higher burst consumption as normally required for RF telemetry can be accomodated as well. Energy harvesters based on the MFC have a lifetime of more than 20 years, which is necessary in order to compete with battery based devices. Designing piezo electric vibration harvesters is not an easy task. It requires knowledge and skill in mechanics, piezo ceramics and electronics to design systems that are cost-effective and highly efficient. Smart Material is actively involved in the research and development of vibration energy harvesters. We have developed the P2 type MFC line mostly as an optimized version for energy harvesting applications. The MFCs with item numbers M8528P2, M8557P2 and M8585P2 are the preferred components used in many energy harvesting applications. Smart Material also presents its research and results at many of the leading conferences dedicated to the growing energy harvesting applications. Check out our Publications section for references. Smart Material has developed a series of evaluation kits and electronic and harvester components to help customers studying this interesting field, for rapid prototyping, and the development of energy harvesting applications based on the MFC product line.